Form 0890 or the "First Tier Future Election Package" is a form issued by the California Public Employees' Retirement System. A PDF of the latest Form 0890 can be downloaded below or found on the California Public Employees' Retirement System Forms and Publications website. First Tier Miscellaneous or Industrial retirement formula is a two-step process. retirement contributions withheld from your paycheck on a prospective basis. Second Tier service to the First Tier retirement formula. 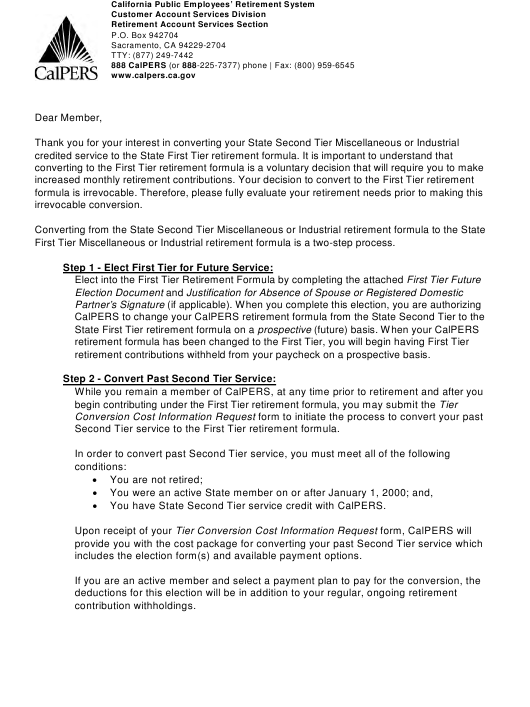 You have State Second Tier service credit with CalPERS. includes the election form(s) and available payment options. (PUB 6), available on the CalPERS website. c) Having all of your service credit under the First Tier retirement formula. monthly retirement contributions that are withheld from your paycheck. No action is required on your part, if you wish to remain in the Second Tier retirement formula. annually until equal sharing has reached fifty percent (50%) of normal contributions. reinstatement before your next retirement can be based on the First Tier retirement formula. at 888 CalPERS (or 888-225-7377). following the date CalPERS receives your Election Document. will be deducted from your monthly earnings on a tax-deferred basis. Justification for Absence of Spouse's or Registered Domestic Partner's Signature form. the submission of the Election Document to be subject to the First Tier retirement formula. form, and submit it with this election. submission of the Election Document for the First Tier retirement formula. whereabouts of my spouse/domestic partner. refused to sign the document(s). of an incapacitating mental or physical condition.